Love, Actually: Carving Out Some Family Fun! Carving Out Some Family Fun! Does anyone else just LOVE Fall? I do. I love everything about it. Especially.....carving pumpkins. This has always been a pre-Halloween must-do for my husband and I! ...and I think it was the best so far! 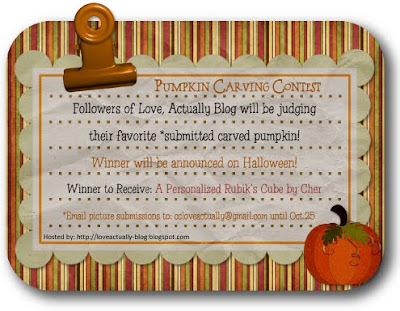 I thought it would be fun to hold a Pumpkin Carving Contest to be judged by YOU right here on this blog! 2. Contest runs Oct. 1 - 25. All submissions will be posted on this blog from Oct. 26 - 30 to be judged/voted on. Winner will be announced Oct. 31. Hit the pumpkin patch and get carving! This is such a fun idea. And since I had NEVER carved a pumpkin in my life it is on my to-do list this year. I'm hoping to host a pumpkin carving party with my neighbors soon. I think that would be so fun. Great idea! This will be so much fun! I'll definitely send a picture of my pumpkin in! Thanks! Brilliant idea! I better get out the knife! I'm soo excited! I love carving pumpkins and I just love the rubix cube you made!! Good luck to all! 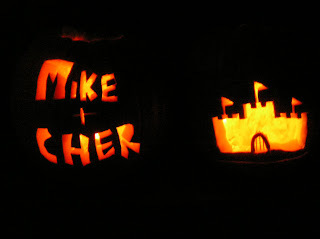 you are so creative--i love your carved pumpkins! so--does it need to be a romantic carving or just a job well done by us and our kiddos??? Well....I can't really say. It's all of YOU who vote. It's whatever the followers vote on...romantic, cute, creative--whatever! I haven't set any specific standard. Hanging out as a family is all I really care about! !